Here is a guide to set up and get Eclipse, PyMel, PyQt4 & Python to work together. When complete, you will have a sweet IDE setup, switch between running everything 32bit and 64bit native AND the ability to compile your own 64 and 32 bit native applications. I am writing this assuming Windows 7 64 bit. I would recommend sorting all the downloads into a 32 and a 64 folder to easier keep track of everything. Note: If you have not done so, I highly recommend a switch to PySide – It will always be included in Maya. PyQt4 x64 – http://nathanhorne.com/?p=204&cpage=1#comment-1978 – Download the 3 files on this post. Install the PyQt-Py2.6-gpl-4.7.3-1 to where you installed Python26 64 bit to. Replace the sip.pyd with the downloaded one. Do NOT pick your main tool folder as the default workbench, pick some other spot (I picked C:/ or myDocuments). In the Available Software Window, you now have a new entry under the Work With drop down list. Select PyDev Address. After reboot, read the creative cash link above. Most important to this one is to add the port connect to userSetup.mel so that Maya can connect to Eclipse. Inside the Predefined tab, click new and navigate to: C:/Program Files/Autodesk/Maya2013/devkit/other/pymel/extras/completion/pypredef. Select the pypredef folder and click OK. When you unchecked Use Default, the Directory Path unlocked. Click Browse and select the top directory of your tool folder. Right click on your project →Properties→Pydev – PYTHONPATH. Add source folders here to your code base for this project. You can also add source folders between projects, by using External Libraries. Rinse and repeat to add as many projects as you want. To set and change the interpreter on a project by project basis (Maya Interpreter for any tool depots that relates to Maya & Python Interpreter for external compiled tools for instance). Right click on your project – Properties→ Pydev – Interpreter/Grammar. Pick one of your defined interpreters in the Interpreter drop down. Right click on Project Name You Gave It→ Properties→ Pydev-PYTHONPATH – add Examples under source folders. Click OK, you now can view and run source code for tons of powerful pyQt examples. It’s a great way to learn…. Set a break point in a python script that will be run from Maya. Go to debug view/mode in Eclipse and start the debug server. Call this from Maya to connect (This utility was written by Jason Parks). To connect remotely to other people and debug their Maya from the comforts of your workstation, set up a Maya call that replaces ‘localhost’ with your machine network name. NOTE: You can copy the code from the python widget by double clicking once then copy. Pymel is no longer autocompleting (can sometimes happen when you jump between interpreters…) – Click Force restore Internal Info Button (Right click on your project → Properties→ Pydev-PYTHONPATH) also select your PyDev project and refresh (F5). Install the py2exe-0.6.9.win64-py2.6.amd64 to C:/Program Files/Python26 and the 32 installer to C:/Program Files(x86)/Python26. Install the 32 bit to C:/Program FIles (x86)/Python26, and the 64 bit to C:/Program FIles/Python26. To get gui2exe to run, right click on the gui2exe.py and in the first tab of properties, set open with 64 bit pythonw.exe – C:/Program FIles/Python26/pythonw.exe. Now you can double click GUI2EXE and compile your own 64 bit and 32 bit Python based programs. In GUI2Exe, go to Options→ Change Python Version…. to swap between compiling for 32 and 64 bit. If you use PyQt for your interface, don’t forget to add sip to included modules…..
To include external modules from your code base, Go to Options→ Add Custom Code. Import sys and sys.append python paths so that the compiler can find the libraries that you are using in whatever tool you want to compile. You now have one hell of a IDE set up with the capability to generate 64 and 32 native applications from your Python code. Great tutorial, there’s nothing like this anywhere else so thanks for taking the time to do it. Inevitably though I do have a question! I’m not getting any MEL highlighting even though the plugin is in the correct directory. Is there a way to activate it or to check that it’s been recognised by Eclipse? Thanks Dan. One way to check is to go to Window->Preferences. Look under General->Editors->File Associations and make sure that *.mel is listed. If not, add it in there…. Also the associated editor for *.mel should be listed as Mel Editor (default)…. Wow. Christian. This is incredible. This solves a major hurdle we were encountering at the studio. Cool Lane! Happy to help people get on this set up. One question though: I’ve seen implementations of this that seem to have a lot of documentation on the commands in the autocomplete suggestion box, however I can’t seem to get that, only the names. Do you have any thoughts or suggestions? Do you know if there is a maximum amount of pymel code that can be sent to Maya from Eclipse at a time? I am not sure Bryce. I tend to send python class reloads and running methods on classes across. By that methodology, the lines that are in effect run are endless. Have you hit that limit? How many lines are you trying to send? Thanks a lot, really nice tut. However I got few issues with the remote debugger. First the debugger stop on every single line, breakpoint or not, it’s quite annoying when you’re executing more than 10 lines. Other “issue”, the script editor is nicely updated while I progress in the debug (line by line ^^) but the viewport doesn’t update, is that an expected behavior ? I found the refresh() trick, but i thought it might be a more conveniant way to do so. Great add! I’ll update as soon as I get a chance…. Im planning to create a Eclipse -perforce workspace which should be synced with another friend of mine living in another country. So i am looking for solutions to sync my workspace over the web. There are some dropbox solutions on the web too. Can you point me in the right direction if you have any ideas? Thanks a lot. Yea, I don’t see a reason you couldn’t Perforce the workspace or even dropBox it. Your paths and code environment would have to be set up the same way (code on the same letter drive and path etc…) We have done this in Wing at work but I have not tried Eclipse. Credit where credit’s due, mate! I’ve had to install dev environments on multiple machines, and this blog has been my consistent “go-to” checklist. Thanks for taking the time to put this together! On a side note, I have a few other reference pages for testing my userSetup.mel and checking my host:port connections (netstat and/or ProcNetMonitor). Perhaps you could append a little note to section 3 of the Maya Connection heading? Thanks again for the hard work in compiling this! Couldn’t have done it without ya, man! Thanks a lot, I appreciate it! I can definitely make that part of the section when I iterate and add a few other great pointers that has come up here. Btw I experience High CPU usage as soon as I connect Eclispe with maya, the java process goes to 100%. I tried on Linux as on Windows 7, with different Eclipse version (from 3.4.1 to 4.1) and both maya 2011 and 2012 but still the same problem of CPU usage with mayaEclipse. I think the link to the latest Java runtime is wrong. Could be changed to update it. Great stuff! I will update with this info. Thanks for the comment. I recently improved some Maya/Eclipse functionality. Since the older mel plugin has not been updated in years and does not function anymore, I added a mel option for the Colorer plugin. Big update and refreshed set up coming very soon. I am in the process of updating this whole setup (new machine at work 🙂 ). Going with the latest and greatest. Will report and update as soon as I know the set up is stable and sound. 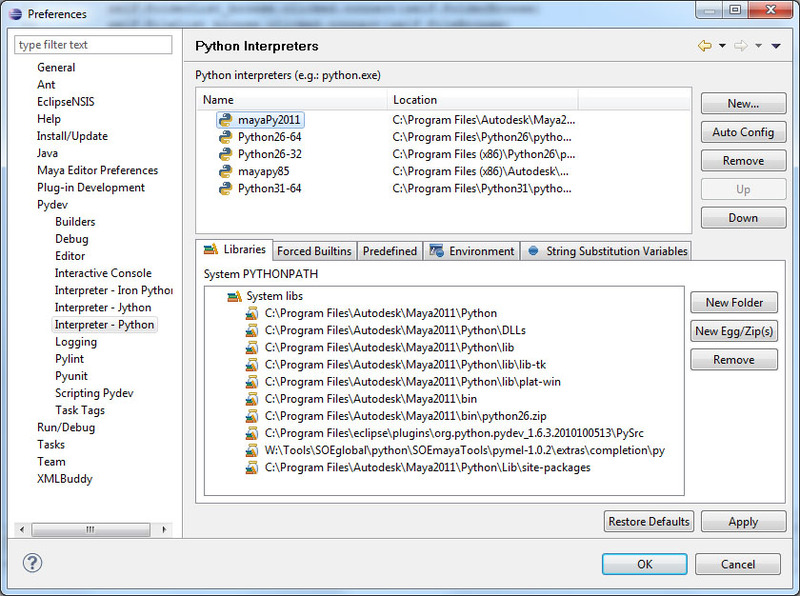 where can i find the Compiled Versions of PyQt4 for python 2.7, coz I have python 2.7 installed. Hi Christian, You step by step tutorial on how to setup Eclipse is really great. Have you tought to record a video tutorial and update it to youtube? Some times things get quick and clear looking at the teacher playing in the blackboard. Great idea Gerardo, especially for the steps that it will cater well to (adding interpreters and projects and maybe a few other steps). Thanks for the input. Wow you replay reaply really fast !!!! Thanks cakesson to think in future video tutorial. I guess everyone will love it. Now that I have color highlights for mel via the colorer plugin for Eclipse I need to discover how to change the colors to get same scheme as in maya console. Once I have that discovered I will post it here too. Cool. I script very little MEL these days. My MEL calls usually go through PyMel’s mel.MelFunctionName(flag=value, otherFlag=value). Very handy and let’s you stay in the Python syntax style. If you figure out what you need, feel free to post. Hi cakesoon, Thanks for your tip!!! I will take this month the Shaun Friedberg Python course for maya as I really need to start using it asap. I guess I will learn cool things there so I will be in touch with you to talk about python soon. In the mean while I am making a video tutorial to help everybody and covering how to install all from scratch. I found how to change the editor to have .mel syntax highlights with same colors as in Maya/Console and I will explain that too in the video. Are you using the Python stand alone version 2.5.6 in x32 and x64 flavors for some reason? Let me know if I need to take some special consideration on that. I am installing both 32 and 64 bit Python so that I can compile my own 64 and/or 32 bit Python standalone programs. You can go with any version for your external interpreter…..
As you learn, Python in Maya, make sure you leverage PyMel. I have an overview in my blog post on how to create and implement a company wide art pipeline. There is a section in that very long blog post that you will benefit from. It describes the fundamental differences between maya.cmds (autodesk’s original implementation) and pyMel (open sourced initiative that made Maya’s Python implementation truly object oriented as well as more Pythonic). The latter has since been integrated into Maya by Autodesk. Hi Christian, Thanks a lot for the PyMel suggestion. I will read the pipeline implementation soon as it looks greate and a good place to start learning concepts and technics!!! A good Technical Pipeline is mandatory this days. In honor to your great help in writting this post I have recorder a video tutorial following your lead and steps from other authors to Install all from scratch so, I guess it will be usefull to anybody.